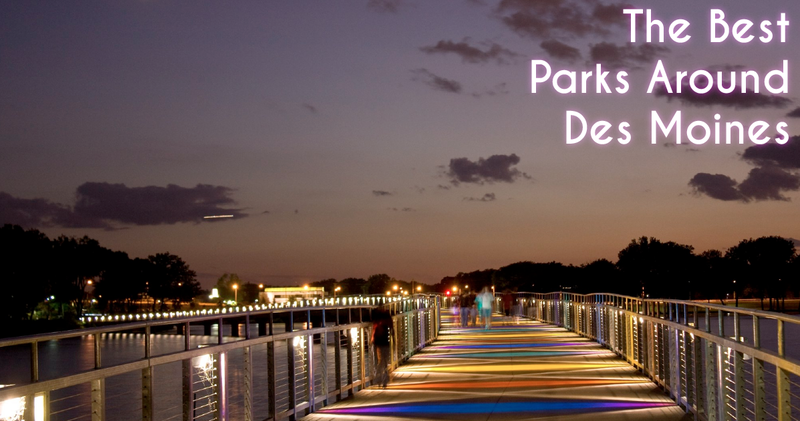 One of the great aspects of Des Moines is the multitude of parks and recreation activities available to everyone; adults, kids, and the entire family. No matter where you are in the city, near downtown, Urbandale, Johnston, Waukee, or West Des Moines, there is a park for you. If all you’re looking for is a trail, you’re in luck too! The most well-known park throughout Des Moines is Gray’s Lake. Most recently, Gray’s Lake has been a spot perfect for watching Bald Eagles! The lake is often home to local running races given the nearly two miles of lake-front to run around. This park, 167 acres of grassland, lake, beaches, also includes a bicycle rental program right on site. Kids and adults are also allowed to fish in Gray’s Lake which can make for hours of fun for the entire family. You can easily stay up to date on all things Gray’s Lake by checking out their Facebook. A few miles west of Gray’s Lake is equally fun Raccoon River Park. Most people know this park by it’s softball complex, but it also has an enormous dog park (for both small dogs and big dogs) with an archery area! There is a nature lodge available for rent and playground equipment for children of all ages. To top it off, there is a boat ramp area to help you get out and enjoy the water at Raccoon River Park. Historic Waukee offers a multitude of park options and Centennial Park has something for everyone. At 33-acres, Waukee’s Centennial Park has sand volleyball courts, baseball fields, a disc-golf course, three playgrounds, a basketball court, and shelters for family gatherings and birthday parties! Even with all those activities, there is plenty of space for family outings, a pick-up game of soccer, or a picnic with family and friends. The park also has charcoal grills and picnic tables for use throughout the season. Another great park in Des Moines in Ashby Park. This park offers one of the most attractive and popular wading pools in the city. Ashby Park has a splash pool, rain garden, two playgrounds, tennis courts, and a nature trail. Overall, the park has something for everyone! The city of Des Moines and all the surrounding metros from Ankeny, Johnston, Waukee, and West Des Moines, all have great parks for family fun throughout the spring, summer, and fall. Have Questions? Contact Space Simply! Space Simply's agents are ready to answer your questions about all things Des Moines, and help you through any real estate questions you have! Connect with us online or at (515) 423-0899 to discover how you can list your home with Space Simply and avoid the expensive fees and commissions associated with traditional real estate agents.